Home Front In-Deck Picnic Table, a pair of benches and a table top which will fix under any of the range’s clubhouse. 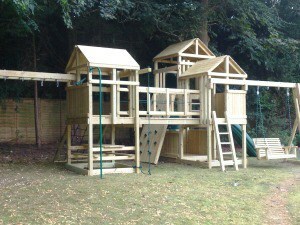 The Home Front In-Club Picnic Table is designed to fit underneath the deck of the Jungle and Mountain climbing frames. The Jungle deck is set at 1.5m high (5ft) while the Mountain has two decks at 1.5m and 2.1m (7ft) high. 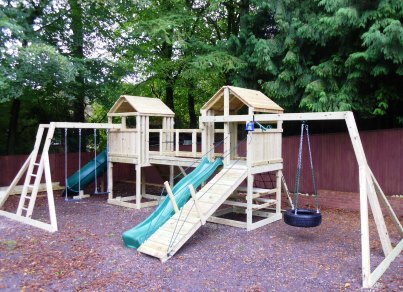 Suitable for children only, it consists of a pair of 1.4m long benches plus a 1.4m long table top, all supported by four brace bars. 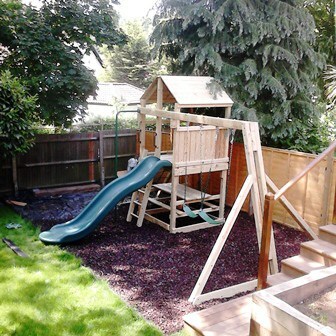 Due to the unique design, the Home Front In-Club Picnic Table is only available when purchased as part of a Home Front Jungle, Mountain or Cosmic Climbing Frame set. This is a Factory Direct item. A confirmation of your order along with an ETA will be posted to you, later you will receive a call to confirm the delivery date and time. We deliver this Home Front product to England, Scotland and Wales only. A delivery surcharge will apply to Scotland and any British Islands.